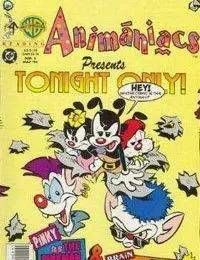 Doing what they do best, Yakko, Wakko, Dot and all their crazy cartoon cohorts romp through one nutty narrative after another. This time around, Pinky and the Brain concoct another ridiculous plan to take over the world in Global Disorder -- a scheme that somehow involves leather pants, laughing gas and the United Nations. On top of that, the Warner brothers and their Warner sister, Dot, lend a hand to Christopher Columbus in discovering...California?